Did you know that you can subscribe to all your favourite CKUT shows? 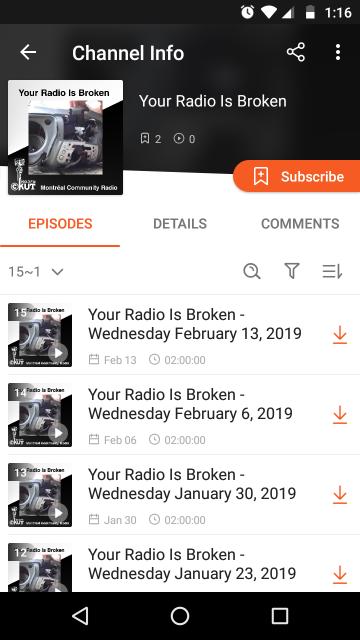 In a few simple steps you can set up most music players and podcast apps to automatically download each week’s episode. It’s pretty easy and you’ll never miss a show! -First, if you use iTunes, you can just click the “Subscribe in iTunes” link on every show’s page. Otherwise, keep reading! -Every CKUT show has a RSS feed on it’s show page. It’s listed above the the archives for past weeks and below all the other content. -Open your favourite music player or podcast app that can subscribe directly to podcasts. -Go to the area to add new podcasts and add a subscription. Depending on the program this will work differently. You need a program that allows direct subscription to RSS feeds. 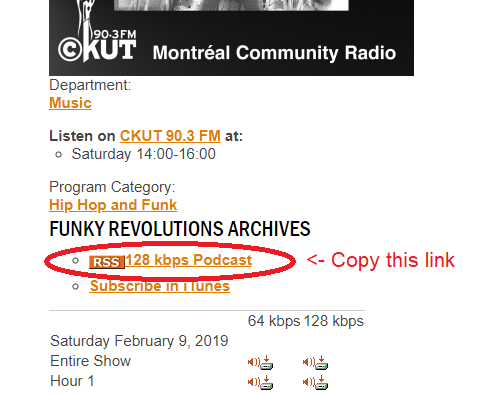 -When you add a podcast/subscription/RSS feed, you will be asked for a URL - just paste the RSS link that was copied from the show page. Save, click okay, or click subscribe if you need to. -The show you selected should now be added to your podcast directory and downloaded automatically every week. Note: the first minute or two may be another radio show. -Now repeat the process for all your other favourite shows!